Junior Carolyn Helmers performs with her band at Churchills in August. The band, Testökra, maintains an alternative feminist style. Carolyn Helmers, a UM junior majoring in history, spends more time writing about feminist history than reading about it in textbooks. Her all-girl, alternative-music band, Testökra, formed last winter as a means for Helmers and her two bandmates – bassist Anna Hart and drummer Ale Campos – to voice their opinions on women’s issues. With an aggressive sound and politically charged lyrics, Testökra’s music shows women what it means to be a feminist today. 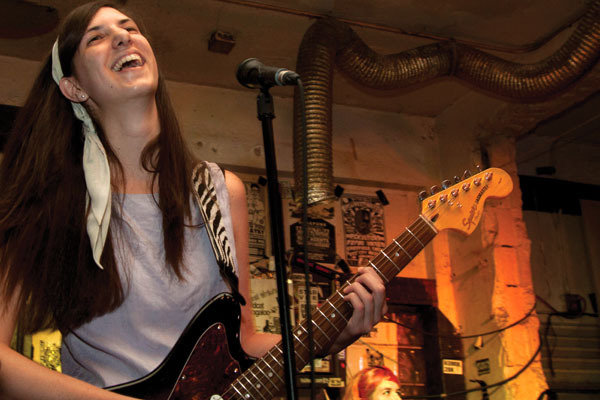 The Miami Hurricane spoke with Helmers about her musical inspiration and how she and her bandmates dispel rumors that feminists are man-haters. The Miami Hurricane: Given the genre that your band is in, how do your studies at UM relate to the themes in your music? Carolyn Helmers: I’ve been interested in feminism since I was about 12, because that’s when I started listening to feminist bands. But then it really kicked off at UM. Since I became a history major, I just got very, very into social thought and feminism and the civil rights movement. TMH: Can you tell me a little bit about your involvement with WVUM? more involved with the local music scene than I was, and that’s really what got me to go out and go to shows and meet people. TMH: How did you get so involved in this genre in the first place? Most people don’t know it exists. CH: It’s definitely a seemingly random genre. When I was 12, I started listening to Hole and Courtney Love. … It’s very relatable as a girl because all of the lyrics are about women’s issues and it’s all sung by women. As a result, I’ve always preferred girl-sound bands. TMH: What are some bands out there that have inspired you? CH: My two favorite bands that really changed my life are Hole and this other band, Babes in Toyland. … Heavens to Betsy is a really big influence because they’re very political and I’ve actually found myself writing songs that kind of sounded like Heavens to Betsy before I had even listened to Heavens to Besty … And Bikini Kill was probably the most famous Riotgrrrl band … It’s really cool to hear young women sing such heavy and angry music, especially because the mainstream today is Nicki Minaj and Regina Spektor, which is cool but it’s not really at all comparable to the ‘90s girl bands. TMH: So what does the word ‘feminist’ mean to you? CH: Feminism means wanting equal treatment, equal rights, social rights, economic rights and political rights between men and women. It’s not about hating men at all. We don’t hate men. It’s basically confronting the subtle sexism in today’s world because it’s definitely out there. Just because I’m a girl doesn’t mean I read Cosmo and watch rom-coms. It’s about being a conscious individual and thinking about the way society treats us. For more information, visit Facebook.com/Testokra.